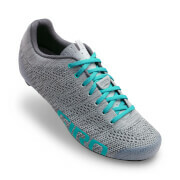 The Factor Techlace™ is a race-bred cycling shoe that couples the benefits of our Techlace system with the easy adjustment of a Boa dial, plus the performance you except from Giro - all at an impressively low weight of 210 grams (size 42.5). The Techlace system replaces D-rings and other hardware with laces, providing a more supple feel across the forefoot, and the laces can be easily replaced if damaged. The Boa IP1 dial offers fast, intuitive adjustment in 1mm increments when tightening or loosening. 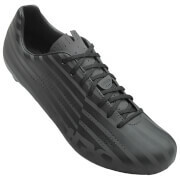 The Factor Techlace upper is constructed with Evofiber SL, which is durable yet highly breathable. Inside the shoe, our SuperNatural Fit footbed features adjustable arch supports to personalize fit, comfort and pedalling efficiency. Power transfer is bolstered by the Easton® EC90 SLX2 carbon fiber outsole, which is among the lightest, thinnest and stiffest pedalling platforms on the road, giving you a direct connection to the pedals. TECHLACE AND FACTRESS TECHLACE - This extraordinary design is driven by our patent-pending Techlace system, which couples the benefits of laces with the convenience of a strap for superb fit and easy adjustment on-the-fly. By replacing D-rings and other hardware with laces, the Techlace system provides a more supple feel across the forefoot. Plus, the laces can be easily replaced if damaged. In addition to the adjustability of two straps, we’ve utilized the Boa Closure System to achieve precise adjustment and a secure feel at the top of the instep with their premium IP1 dial. Boa’s dial interface offers fast, intuitive adjustment in 1-millimeter increments when tightening or loosening. BOA IP1 DIAL - BOA IP1 Dial Fast, intuitive adjustment in 1 mm increments when tightening or loosening. EASTON EC90 SLX2 OUSOLE - Easton EC90 SLX2 Outsole Among the lightest, thinnest and stiffest pedaling platforms on the road. TECHLACE SYSTEM - Techlace System Replaces D-rings and other hardware with laces, providing a more supple feel across the forefoot, and the laces can easily be replaced if damaged. 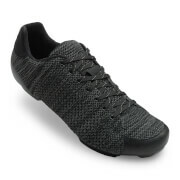 These are my third pair of top-shelf Giro cycling shoes. They are good, very good. These new versions are good, ... but not great. They have incorporated the latest giga-gooba-things. Seemingly not as good though. The boa strap creates some tightness (i.e., tightspots / hotspots). The Tech-laces which come with the shoe are somewhat short but I'm hoping to be able to buy longer ones (I think there are longer ones available... I'll have to do some searching for those). Also, I've read some feel the body of the shoe is 'smaller' than previous versions. I would suggest this is mostly true. This being said, I had a 47 in previous versions, and have a size 47 in this as well. I'd not go to a 48. This new 47 is a slight bit tight, petite, but I'm hoping they become just a little bit bigger (you know, ... stretch out a little bit). Another reason I began using the Giro shoes was because they were meant to be a very stiff 'neutral' shoe; they were once sufficiently spacious for a pair of orthotics. They used to be, yes. Now though, ... a lot less so. The toe box has a bend 'up'. Honest..! This bend up actually reminds me of a pair of Shimano shoes which had a similar bend up (albeit more pronounced). Are they worth it though? Yes, absolutely.